Barack Obama has spent the last seven years making good on his promise to “fundamentally transform” our nation. The problem is that the nation didn’t need any fundamental transformation – the system of government given to us by our founders, or as Ben Franklin said in 1787, “a republic, if you can keep it”, served us well. At this point there is very little left of a republic that was based upon limited government and individual liberty. Through the gradual erosion by those who prefer to replace those ideals with a socialistic, globalist vision, the “transformation” (destruction) is all but complete. Despite this unbridled growth of the federal behemoth, the one most imperative responsibility of the federal government – that of providing for the common defense - has been abrogated. Obama’s desire to flood our nation with 250,000 Syrian refugees isn’t just a misguided policy – it’s a recipe for a disaster of epic proportions. Obama, along with his fellow travelers on both the left and the right who support open borders/amnesty have already caused this “transformation” to change the very makeup and culture of the United States to the point that – as Breitbart news said in a recent headline, the “Majority of Americans Feel Like ‘Stranger in Own Country’”. The Breitbart article was linked to results from an Ipsos poll where a strong majority of people agree that they do indeed feel like strangers in their own country. Who can blame them? When millions are here illegally who don’t speak English and won’t learn, who care nothing about our culture and history and prefer that which they left behind, who gobble up benefits provided by the American taxpayer, who wind up displacing American workers who need jobs, not to mention that every day the news includes more stories about illegal aliens who have murdered, raped, driven drunk and killed innocent Americans and then fill our streets demanding their “rights”- and do so without any fear of being deported by the Obama administration – is it any wonder that Americans feel like they are indeed strangers in their own land? Is it any wonder that Donald Trump is resonating with so many? The recent attacks in France have demonstrated just how reckless unchecked immigration truly is. Europe is seeing the inevitable chickens coming home to roost. The Islamic invasion of Europe has been allowed to go unchecked for a number of years, resulting in large enclaves of Islamists that reside in what has come to be known as “no go zones”, or perhaps more accurately as Daniel Pipes said, “semi-autonomous sectors”. Regardless of what you choose to call it, granting any form of autonomy to hostile groups on your own soil is a less than safe proposition. The groundswell of European natives had already been rising, calling on their governments to put an end to this insanity before the recent Paris attacks. Now the opposition from everyday Europeans has reached fever pitch, resulting in at least some of those nations to rethink their stances on immigration. The fact that at least one of the attackers in France arrived using a Syrian passport demonstrates just how easily Jihadists can embed themselves with the wave of “refugees”. Implementing a temporary freeze on all immigration – legal and illegal – is a logical safeguard as we sort out what is going on. At the very least, halting any and all “refugee” resettlements into our country is the compellingly logical first step. Unfortunately this president has been incredibly devoid of logic with regard to the situation (or any other for that matter). He has doubled down on his call for more refugees to be brought into our cities and towns against our wishes – this despite the fact that in addition to a majority of Americans, a majority of states’ governors are now on record opposing the resettlement. The states have this right by virtue of the tenth amendment but Obama no doubt will show no more fealty to the constitution on this matter than he has on any other. As this article was being written, Obama made a statement that he is “not afraid” of ISIS defeating us (or ISIL, as he for some reason prefers to call them). No, I don’t suppose Obama would be particularly afraid when the government spends millions of taxpayer dollars annually on armed secret service agents, equipment, armor-plated limousines, intel and the like for his protection. It is disturbingly ironic that while the president is afforded this much protection he remains vehemently opposed to our own second amendment rights (although that would be a subject for another column). 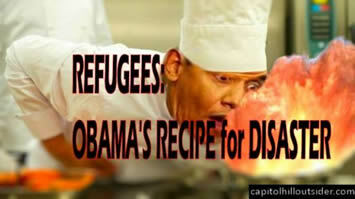 As far as Obama is concerned, it’s full steam ahead for Syrian (and all other Islamic) “refugee” resettlement. His recent statements that those opposed to his policy are “scared of widows and orphans” and that we who prefer Christian refugees to Muslims coming to America are “un-American” are as Pat Buchanan said in a recent column, “petulant and unpresidential.” On target as usual, Buchanan said later in his column, “Who is this man of the left to dictate to us what is ‘un-American’?” Indeed. Stopping our borders from being overrun by people who at the least do not wish to assimilate into our culture, and at the worst, pose a threat to our very existence isn’t being “xenophobic, hateful, bigoted, racist, ad nauseum” – it’s common sense – something in short supply in Washington these days. The aforementioned Donald Trump, on a recent interview with radio host Michael Savage, basically stated that we are “19 trillion in debt and bringing in refugees” – the Middle East is letting the U.S. do it because (our leaders) “are dumb”. The fact is that Obama’s stance is reckless and dangerous – so much so that there should be a serious investigation into removing him from office through impeachment or perhaps the 25th amendment. There is an old saying that even a broken clock is right twice a day. Sadly, Barack Obama does not even possess the acumen of a broken clock. Chip McLean is the founder and editor/publisher of CHO News Publishing, the umbrella for both Capitol Hill Outsider and Capitol Hill Coffee House. He is also the co-founder, along with Chris Adamo, of Rino Tracker. Chip is a former broadcaster and long time sales professional whose interest in politics began in 1964 at the age of eight, when his parents took him to a Barry Goldwater rally during the presidential campaign. In addition to his work at Outsider News Publishing, Chip’s columns have appeared in a number of online conservative publications.